Light fluffy sponge sandwiched with buttercream and jam, this classic cake is an ideal weekend treat. 1. Preheat oven to 180°C/350°F/Gas 4. Grease and base line two 18-20cm/7-8″ sandwich tins. 3. Divide the mixture between the prepared tins and smooth the top with back of spoon. 4. Bake for about 20 minutes until golden brown and the cake springs back when pressed. 5. Turn onto a wire tray or cooling rack and allow to cool completely. 6. Meanwhile, make the filling by beating the butter until smooth, then gradually beat in the icing sugar. 7. Finally, beat in the vanilla essence, if used. 8. 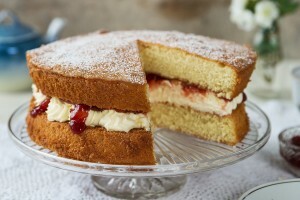 Spread the buttercream filling over the base of one of the sponges, spread the jam over the other and sandwich the two. 10. Store in an airtight container and enjoy within 3 days. This entry was posted in Cake, Christmas, Desserts, Easter. Bookmark the permalink.